Film buffs have been eagerly waiting to watch Genius for multiple reasons. After teasing the audience with an intriguing & thrilling trailer which showcases different shades of Vasudev Shastri aka Genius, director Anil Sharma is all set to reveal the entire story to the audience on August 24th. Before the movie hits cinema screens, we decided to list a bunch of reasons why we’re watching the movie this August and why you can’t afford missing it too! 1. Music by Himesh Reshammiya: A multi-faceted versatile music composer, Himesh Reshammiya is a widely loved known winner, winning hearts around for over a decade with hits like Aashiq Banaya Aapne to Hookah Bar. Tera Fitoor (Arijit Singh) & Dil Meri Na Sune (Atif Aslam) have resonated with music lovers and are rapidly climbing the music charts ever since they have been out. 2. Nawazuddin Siddiqui: Having surprised the audience with whatever character he has played till now, this star needs no introduction. Known to dive into various shades of his character & for his compelling dialogue delivery, he essays the antagonist in the film and has given another masterful performance. 3. Directed by Anil Sharma: A director who knows the winning formula using ingredients of love and patriotism with films like Gadar: Ek Prem Katha & The Hero: Love Story of a Spy. After Singh Saab the Great, he is back to enthrall us with the same combination but in an entirely new andaaz & we are absolutely sure that the fans will love it. 4. Action Scenes: With some breathtaking action sequences between the two Geniuses – Utkarsh Sharma & Nawazuddin Siddiqui, your eyes will remain glued to the screen. The film takes you on a stirring adventure with some insane stunts between the actors. 5. Mesmerizing locations of India: In a time when many directors prefer foreign grounds, director Anil Sharma preferred staying desi and shot the movie across India, starting from New Delhi to Indore to Lavasa. Except for India, Mauritius is the only foreign location where the movie has been shot. Anil Sharma Productions presents the official Introduction of Utkarsh Sharma from the upcoming Bollywood movie Genius. 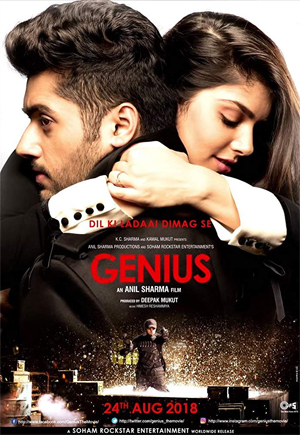 Directed by Anil Sharma, Genius is an upcoming romance thriller introducing Utkarsh Sharma and Ishita Chouhan. Utkarsh is fondly remembered by all for playing Sunny Deol & Ameesha Patel’s son in Gadar. The film also stars Mithun Chakraborty, Ayesha Jhulka and Nawazuddin Siddiqui in pivotal roles. 15 queries in 1.158 seconds.